Consumers demand healthy snack products with an enhanced taste and ‘mouth feel’ and we have a technology that will change the way you think about potato chip processing. Just when you thought the potato chip couldn't get any better, this technology that was developed and tested over a number of years, introduces the processor to an efficient processing system that has significant product improvement in the chip crunch, taste and texture. 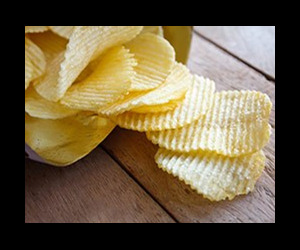 Using the process of Pulse Electric Field (PEF) technology, the E-FLO™ Electroporation processing system by Heat and Control has been developed with not only the processor in mind, to help with improving yield, but also the consumer, where the potato chip is crunchier and also healthier. The Pulse Electric Field (PEF) process perforates the cell walls of the potato, creating 'micro' holes that allow the asparagine and sugars to be washed out of the potato in a cold wash, which lowers acrylamide in the final product. This process reduces or eliminates the need for blanching in most cases. Heat and Control has released the E-FLO Electroporation processing system to our range of equipment, which has shown significant product improvement in the chip crunch, taste and texture, as well as achieving reduction in acrylamide formation and oil content. Which also means the potato chip is lower in fat content. "This new product enhances our range of equipment and adds a new variation to the way the potato product is prepared prior to the frying process", says Bobby Kane, Sales Manager South and West Europe and Middle East regions. 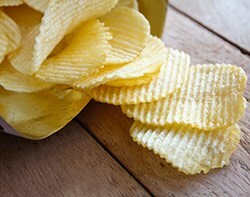 "Current testing shows lower acrylamide in the final product, whilst producing a healthier and better tasting, crunchier quality potato chip". There is noticeable improvement in cutting or slicing of potatoes which has a two-fold effect. Firstly, slicer yield is higher; plus, the slicer blade life is extended. Secondly the improved texture of the potato slices themselves means there is less oil uptake during the cooking process, resulting in a healthier product. Processors can also realize further cost savings by the reduction of blanching requirements in the preparation of the product. This patent protected technology is now available to provide key food safety, quality and efficiency enhancements for the food processor. The design is compact for easy integration into existing processing lines or new lines. Applications are for the Potato Chip and the French Fry product, with formed potato products and other root vegetables to follow.